The extinction 252 million years ago was so dramatic and widespread that scientists call it "the Great Dying." The catastrophe killed off more than 95 percent of life on Earth over the course of hundreds of thousands of years. "Volcanic activities, including emissions of volcanic gases and combustion of organic matter, released abundant mercury to the surface of the Earth," said lead author Jun Shen, an associate professor at the China University of Geosciences. "Typically, when you have large, explosive volcanic eruptions, a lot of mercury is released into the atmosphere," said Thomas Algeo, a professor of geology in UC's McMicken College of Arts and Sciences. "Mercury is a relatively new indicator for researchers. It has become a hot topic for investigating volcanic influences on major events in Earth's history," Algeo said. "We're often left scratching our heads about what exactly was most harmful. Creatures adapted to colder environments would have been out of luck," Algeo said. "So my guess is temperature change would be the No. 1 killer. Effects would exacerbated by acidification and other toxins in the environment." Stretching over an extended period, eruption after eruption prevented the Earth's food chain from recovering. "It's not necessarily the intensity but the duration that matters," Algeo said. "The longer this went on, the more pressure was placed on the environment." "The release of carbon into the atmosphere by human beings is similar to the situation in the Late Permian, where abundant carbon was released by the Siberian eruptions," Shen said. "A majority of biologists believe we're at the cusp of another mass extinction—the sixth big one. I share that view, too," Algeo said. "What we should learn is this will be serious business that will harm human interests so we should work to minimize the damage." "We're likely to see more famine and mass migration in the hardest hit places. It's a global issue and one we should recognize and proactively deal with. It's much easier to address these problems before they reach a crisis." Did an impact with an asteroid trigger the volcanism? @V4Vendicar, a good question. A number of people have suggested the volcanim was started by an impact 180 degrees opposite the traps (i.e. antipodal). This would have caused a large shock wave to travel through the earth and cause massive disruption in the crust, causing the massive lava outflows. This idea is not well received for various reasons. However, an impactor could have started the eruptions. 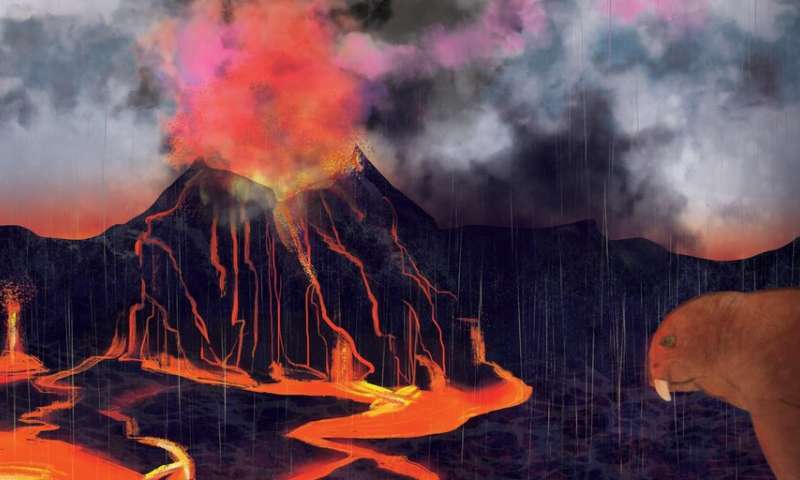 The long duration of the extinction event, killing many species over hundreds of thousands of years might suggest that continuing volcanism and its associated impact on fossil hydrocarbons etc. looks like the primary cause of this event. It does not seem to be so. AFAIU the Deccan Traps are not exactly on the other side of Earth at the time due to continental drift, but they are shielded from deep waves by the core. The Siberian Traps has no known time correlation to an impactor, I believe (or at least none I have heard of). The P-T extinction here was the result of a plume in an unlucky place [ https://en.wikipe...an_Traps ]; the K-Pg extinction was the result of an impact in an unlucky place [ https://en.wikipe...on_event ]; the Deccan Traps was the result of unlucky interactions between the Indian, Asian and African plates and a plume [ https://en.wikipe...an_Traps ]. Rare events, luckily. The long duration of the extinction event, killing many species over hundreds of thousands of years might suggest that continuing volcanism and its associated impact on fossil hydrocarbons etc. looks like the primary cause of this event. It does not look like the primary cause except for a fringe, mind. For the rest of involved scientists it looks like a minor contributing factor, with the impact as the clear major extinction trigger; the biomes before and after impact is markedly different (no non-avian dinosaurs after, say) and the pin-pointing of this and other effects has been increasingly robust as more science has accrued. Reading this article will also tell you that another impact event near the Deccan traps also occurred around 66 millions years ago. Take your pick, or not. I do not think the story is as clear as some would have others believe. Antipodal impacts causing volcanism has been suggested by a number of experts. Opinions on either perspective seems to be the two general themes. Many of these ancient events are difficult to determine the precise cause as the data which might define them is long gone. Speculation is all that remains. If you want some wild reading, check out uranium decay in zircons. This will provide some remarkable notions about the mixing of the earth's mantle, and the likelihood of various super-continents forming and separating, etc. Evidence for antipodal volcanism on Mars. In case anyone has the notion that an impactor cannot result in antipodal volcanism on Earth, one should look at other planetary bodies to determine if such things are even possible. And when one looks at Mars, you find three massive impact crators are antipodally related to massive volcanic activity. There are three giant crators with known prior volcanism nearly opposite the side of impact. These resulted during the late great bombardment. That the earth is substantially bigger does not rule out the effect. It simply requires a larger impactor. Of course some can always dismiss these three events on Mars as mere coincidence. I would not be one of them. Remember that these events took place about 4 billion years ago, so precise antipodal locations are not essential to suggest a cause and effect. There's an impact theory involving the Wilkes Land crater in Antarctica, and the timing seems right (not with high resolution, but still) but it doesn't seem well supported. DS, read about the one you mentioned. There is also a really jumbo crater at the Falkland Islands which dates to the right time period. It has the classic rings of a large impact, but appears to be a glancing hit. The doubters about this being an antipodal impact to the STs is the lack of globally distributed shocked quartz, iridium, etc. However. since the volcanism released many, many orders of magnitude more debris than could have come from the impactor, it seems possible that any evidence for it would be low level noise in the enormous mass of volcanically produced residue.